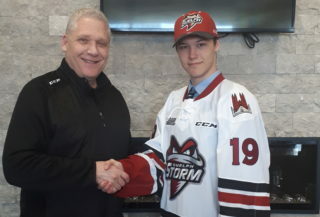 It took only 14 seconds for the Guelph Storm to find the back of the net in Sudbury on Friday night and they never let up in an impressive 5-2 win over the Wolves. Making his hometown debut in front of a huge group of family and friends, rookie Tyler Bertuzzi made the night a memorable one as he notched his first ever OHL goal. Frank Menard opened the scoring for the visitors. After netminder Johan Mattsson misplayed a ï»¿Brock McGinn dump in off the opening faceoff, Scott Kosmachuk scooped up the loose puck and dished to Menard all alone at the side of the net. The Storm added to their lead on their first man advantage of the night at 12:55 of the first. Cody McNaughton recorded his team leading fifth powerplay goal redirecting an Andrey Pedan wrist shot by Andrey Pedan. Despite the two goal cushion after twenty, it was the Wolves that owned the shots on goal advantage, but Brandon Foote stopped all eleven Sudbury attempts. Two more goals by the 12:21 mark of the second including Bertuzzi’s first and it was 4-0 Guelph before the Wolves replied. Stephen Gaskin’s second of the season from Kyle Pereira proved to be the eventual winner. Then Bertuzzi notched his milestone marker taking a feed from Jason Dickinson and sliding it under Mattson. The Sudbury native’s goal brought an end to Mattsson’s night. While at the other end, Foote was perfect through almost 38 minutes, until Brody Silk stepped on the ice off a line change and snapped his third of the season inside the far post. 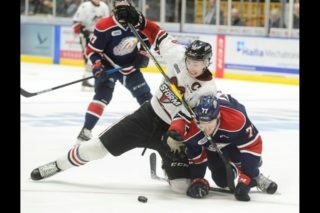 The two clubs exchanged strikes in the third with Sudbury taking advantage of one of four straight powerplays while Guelph’s Scott Kosmachuk scored at even strength. McGinn picked up his second assist of the contest with a smart thread pass that sent Kosmachuk in all alone on Brendan O’Neill. 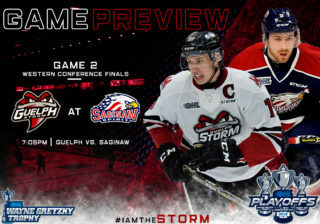 Tomorrow night, the Storm will travel to Sault Ste. Marie to face the Greyhounds before returning to home ice next Friday night for a Midwest Division tilt against the Erie Otters. 1st Period-1, Guelph, Menard 5 (McGinn, Kosmachuk), 0:14. 2, Guelph, McNaughton 7 (Pedan, Richard), 12:55 (PP). Penalties-Leivo Sby (slashing), 12:16; Richard Gue (fighting), 17:27; Restoule Sby (fighting), 17:27. 2nd Period-3, Guelph, Gaskin 2 (Pereira), 4:50. 4, Guelph, Bertuzzi 1 (Dickinson, Auger), 12:21. 5, Sudbury, Silk 3 (Sgarbossa, Jambrosich), 17:53 (PP). Penalties-Restoule Sby (hooking), 5:49; Mintz Sby (roughing), 15:22; Finn Gue (cross checking), 16:29. 3rd Period-6, Guelph, Kosmachuk 7 (McGinn, Gaskin), 1:37. 7, Sudbury, Kontos 6 (Campagna, Corrado), 14:04 (PP). 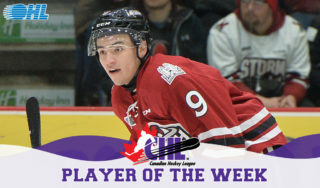 Penalties-Pedan Gue (check to the head), 5:55; Leivo Sby (roughing), 5:55; Garlent Gue (tripping), 9:01; McNaughton Gue (elbowing), 13:12; Kosmachuk Gue (slashing), 18:21; Mitchell Gue (cross checking), 19:26. 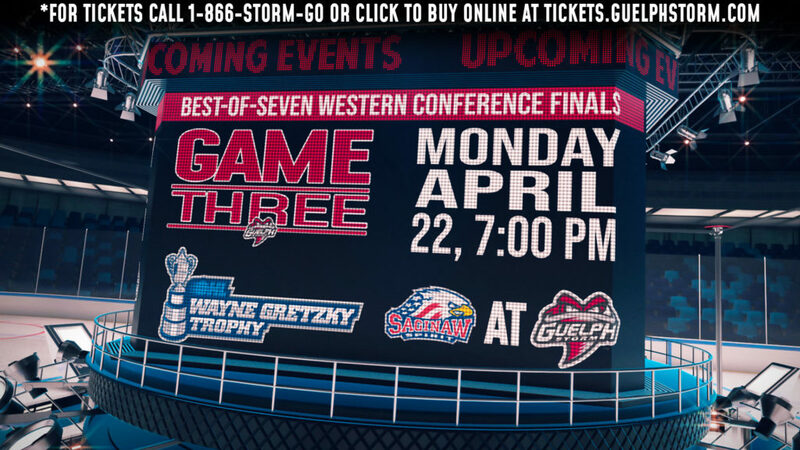 Shots on Goal-Guelph 9-15-3-27. Sudbury 11-10-14-35. Power Play Opportunities-Guelph 1 / 3; Sudbury 2 / 5. 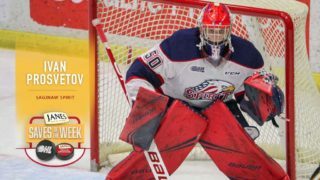 Goalies-Guelph, Foote 2-1-1-0 (35 shots-33 saves). Sudbury, Mattsson 5-2-0-0 (19 shots-15 saves); O’Neill 0-4-0-0 (8 shots-7 saves). Referees-Dave Koziel (8), Mike Marley (31). Linesmen-Jean-Yves Maillet (45), Steve Dix (98).